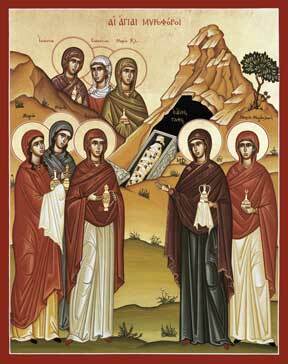 The Sunday of Myrrh-bearing Women falls on the second Sunday following Pascha. The myrrh-bearers had brought funeral spices and ointments to finish commiting Christ's body to the grave. They were the first to see the empty tomb and were instructed by the risen Lord to bring the joyful news to the apostles. Ss. Joseph of Arimathea and Nicodemus are also commemorated on this day. Of the eight, the first five are the more prominent and outspoken. The last three are included according to tradition. Five of these women were also very wealthy; the women of means were Mary Magdalene, Joanna, Susanna, and Mary and Martha of Bethany. A confusing aspect in Gospel references to these women is that two of the Marys had a son named James. Mary, the wife of Alphaeus, was the mother of James, one of the Twelve Apostles; the Virgin Mary was the step-mother of James, the Lord's brother (Matthew 13:55, Galatians 1:19). In Western tradition, James, the son of Alphaeus, and James, the Lord's brother, have sometimes been identified as the same person. In Eastern tradition, James, the Lord's brother was Bishop of Jerusalem from 30-62 AD and never left the vicinity of Jerusalem. 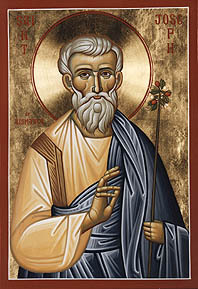 He is the James who rendered the decision of the council of Jerusalem in 48 AD (Acts 15:13-19). Eastern Tradition links James, the son of Alphaeus, with evangelism abroad, especially in Egypt where he was martyred. One helpful tip that can clear up the confusion between these two Marys is the passage that refers to the Virgin Mary as the mother of James and Joseph (Matthew 13:55). This Joseph is also called Barsabas, Justus, and Judas (Acts 1:23 and 15:22). Therefore, in Matthew 27:56, the women looking on from afar at the cross were Mary Magdalene, the Virgin Mary (that is, Mary the mother of James and Joseph), and Salome (the wife of Zebedee and the Virgin Mary's step-daughter). Matthew refers to Mary Magdalene and "the other Mary," who is probably the Virgin Mary also from the context (Matthew 27:61 and 28:1). Such Church Fathers as St. Gregory of Nyssa and St. Gregory Palamas support this interpretation. Similarly, St. Gregory of Nyssa identifies "Mary, the mother of James" (Mark 16:1 and Luke 24:10) as the Virgin Mary also. These eight women had been together a lot during Jesus' three-year public ministry. Mary Magdalene, Joanna, Susanna, and others (Luke 8:3) are described as providing for Jesus out of their possessions (that is, acting as deaconesses). These same women had faithfully followed him from Galilee and had come up with him to Jerusalem (Matthew 27:55, Mark 15:40-41, and Luke 23:55). But cry ye, 'The Lord is risen, granting the world the Great Mercy.'" This page was last edited on April 24, 2012, at 22:58.